Airports have gone to the dogs (and, in some places, cats). Jet-set pets looking for pre-flight places to do their business have an increasing number of options at airports across North America. Once relegated to the outskirts of the airport or before security checkpoints, pet relief stations are popping up post-security thanks to a federal regulation that requires airports that serve more than 10,000 passengers a year to have pet relief areas in each terminal for service animals that accompany passengers. Most airports have extended the use of pet relief stations to law enforcement dogs, emotional support animals and airport therapy dogs. While many pet relief areas are merely small patches of fake grass in hidden corners of terminals, others are pet parks with real grass, faux fire hydrants and space to run and play. We checked in at top airports across North America to get the scoop on post-security pet relief stations so you can find the best rest stops for your furry friends. Boston‘s Logan International Airport offers four-legged travelers four Petports – small, no-frills grassy relief areas – in Terminal A, Terminal B, Terminal C and Terminal E. Their location within the terminals means two-legged travelers don’t have to leave the terminal and go through security a second time. Chicago Midway International Airport offers two options for pet and service animal owners: one indoor and one outdoor. The indoor pet relief area at Gate A4A in Concourse A is an enclosed room where pets can go potty without owners having to go through security again. The outdoor option, located at the south end of the Lower Level terminal drive (exit near baggage carousel #8, turn right and walk past the bus stop), is a fenced-in area equipped with a bench and bags for pet waste. 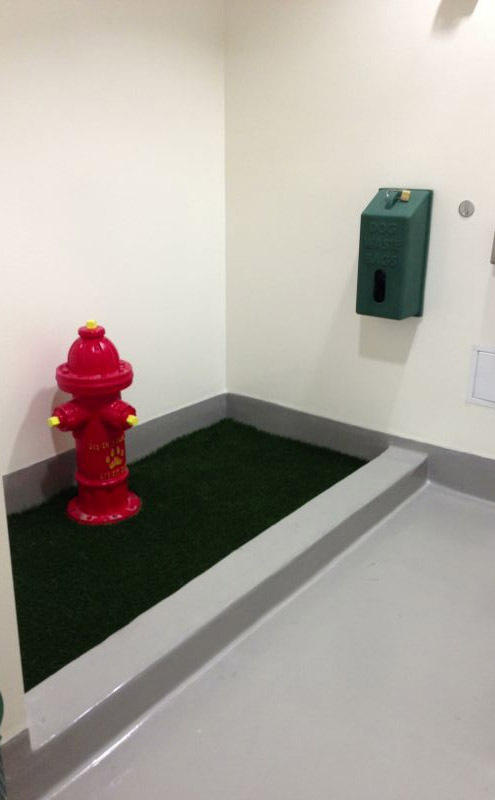 One of the more deluxe options for pets, Chicago O’Hare International Airport’s Pet Relief Room has a duo of two-foot by four-foot pet relief areas, complete with artificial grass covering, miniature fire hydrants and pop-up sprinkler systems to wash away liquid waste into a drain. For extra cleanliness, there is a mounted hose as well as plastic bags for waste clean up. There are two sinks for passenger use too. The pet relief room is located past security checkpoints in the Rotunda area of Terminal 3. Additional options include three outdoor service animal/pet relief areas with real grass, gravel or wood chips located near the lower level curb front of Terminal 1, Terminal 2 and Terminal 5. There are pet relief areas in each of Dallas/Fort Worth International Airport’s five terminals. Three pet relief areas are inside security at Gate B28 in Terminal B, D18 in Terminal D and E31 in Terminal E. Outdoor areas post security are on the lower level at entry doors near Gate A8 in Terminal A, near Gate C2 and C39 in Terminal C, near Gate D15 and D29 in Terminal D and near Gate E2 and E38 in Terminal E. There is also a 24-hour Paradise 4 Paws resort that offers grooming, pet massage therapy, play time, cuddling sessions and treats like frozen peanut butter Kong toys. Both terminals at Detroit International Airport have Service Animal/Pet Relief Areas. However, the McNamara Terminal has one of the most impressive animal relief areas: a $75,000 restroom for dogs in its Delta Air Lines terminal that opened in 2014. Four-legged flyers have two patches of fake and real grass near Gate A34. A sprinkler system helps eliminate waste into drains below the grass. There are bags for solid waste and a sink for owners to wash their hands and re-fill water bottles. There is an additional Animal Relief Area pre-security outside the International Arrivals area (Lower Level). The North Terminal also has Service Animal/Pet Relief Areas: pre-security Animal Relief Areas on grassy areas at each end of the Departures Level (Upper Level) and one within the terminal, post-security across the concourse from Gate D16. General Mitchell International Airport in Milwaukee, Wisc. recently opened an indoor Service Animal Relief Area for passengers traveling with service animals. The area includes K9Grass, soft green synthetic grass designed for dogs and an under-grass flushing system. There are also two outdoor Pet Relief Areas located at the exits of both ends of Ticketing and Baggage Claim. There are several purr-fect places for pets to relax and relieve themselves at New York‘s John F. Kennedy International Airport. JetBlue’s rooftop lounge adjacent to Terminal 5 offers respite for both humans and pets. The 4,046-square-foot rooftop includes landscaped green spaces, seating for 50 people, a children’s play area, food kiosks and a dog walk area. The space is open to all airline passengers and pets. 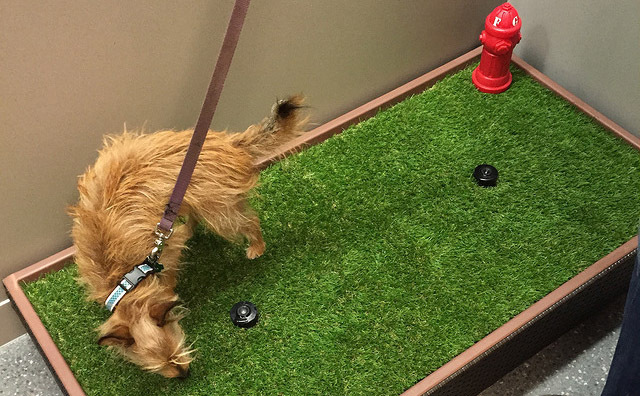 In Terminal 4, there is a 70-square-foot pet relief room that includes artificial green grass, a fire hydrant, a hose for cleaning and plastic doggie bags. The airport is also set to open ARK — a $32 million facility equipped with a veterinary hospital and 24-hour Paradise 4 Paws resort that offers a bone-shaped dog pool, pet suites with flat screen TVs and pet massage therapy among other services — that is scheduled to open later this year. Los Angeles International Airport leads all U.S. airports with the most pet relief areas of any U.S. airport. The airport boasts three mini Pet Parks and seven pet relief stations. The Pet Parks are located on the Lower/Arrivals Level of the Central Terminal (between Terminal 1 and Terminal 2), on the southeast end of the Central Terminal Area (near Terminal 7 and Terminal 8) and beyond security at the Tom Bradley International Terminal. Each park has a small doghouse, trash can and plastic bags for waste. Note: pets cannot be unleashed at the Terminal 7-8 location. Memphis International Airport has three in-terminal pet relief areas, one on the secure side of the B Checkpoint, another at Gate B11 and an additional area at Gate B30. Other pet relief areas are on the Baggage Claim/Ground Level in the grassy area to the left after exiting Concourse A and in the grassy area to the right after exiting Concourse C.
Miami International Airport recently opened an indoor, post-security pet restroom called SARA (Service Animal Relief Area) in Concourse D near Gate 34 and has three more scheduled to open later this month in Concourse F, Concourse G and Concourse J. SARA includes a patch of Astroturf, two sprinkler heads to clear waste and cleaning supplies for pet owners. The airport also has three outdoor pet relief areas. Miami is the first international airport in South Florida to add indoor pet relief areas (Fort Lauderdale-Hollywood International Airport plans to add indoor pet relief areas in Concourse A and Concourse B in Terminal 1 in June 2017, as well as one in Concourse D in Terminal 2 and one in Concourse G in Terminal 4 in 2018, according to the “Sun-Sentinel”). Minneapolis-St. Paul International Airport offers three pet relief areas. In Terminal 1-Lindbergh, there’s a relief spot before security outside Door 1 on the Baggage Claim level as well as a post-security option near the entrance to Concourse E in the Airport Mall. In Terminal 2-Humphrey, there is a grassy area pre-security just outside and to the right of Door 8 on Level 1, near Baggage Claim. The airport also has on-site pet boarding facilities through Now Boarding, which includes overnight boarding, doggie day care, dog training and spa treatments like grooming, massage and a pet therapy pool. Pets flying to and from Philly have plenty of options with pet relief areas in every terminal. There are seven Pet Ports dotting the airport. You can find them in Terminal A-West near Gate A16, Terminal A-East near the bus stop at Gate A1, Terminal B near the B side of the A-B walkway, Terminal C near the C side of the C-D walkway, Terminal D near the D side of the C-D walkway, Terminal E at Gate E1 and Terminal F just beyond the security checkpoint. The fenced-in Pet Ports range in size from 250- to 600-square-feet and each has a faux fire hydrant, mulch and plastic waste bags. Not only does San Diego International Airport offer the Ready, Pet, Go. program, a travel ambassador program with 13 dogs, including a Shih Tzu and Goldendoodle, that provide pet therapy to passengers, the airport also opened the nation’s first dog bathroom back in 2013. Located between Gate 46 and Gate 47 in Terminal 2 West, the 75-square-foot pet relief area includes faux grass, a hydrant, two deodorizers, free waste bags and a hand-washing sink. Seattle-Tacoma International Airport offers three pet relief areas including one post security. Located just before the Concourse B exit, the indoor pet relief area has little more than a roll of Astroturf and a dispenser for plastic waste bags. 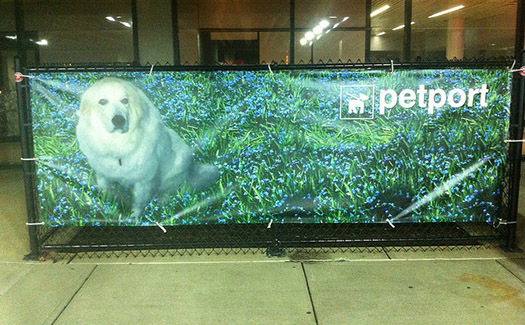 Outside, past Baggage Claim, there are pet relief areas on the north and south ends of the terminal. The north end features a small sandy area and the south end has grass. Vancouver International Airport’s Pet Relief Area near Gate 76 in the United States Departures area offers pooches a place to go potty on artificial grass in a large enclosed area. This is the only Canadian airport that offers an in-terminal pet relief area that doesn’t require re-entry through airport security. Washington Dulles International Airport, Washington, D.C. There are multiple options for service animal/pet relief areas at Washington Dulles International Airport. Post security, there are two ventilated indoor areas with waste bags and receptacles, one adjacent to Gate A32 and one across from Gate D1. Before security, there are three pet relief areas: one at each end of the main terminal on the departures level and another on the arrivals level outside adjacent to Baggage Claim 1. For more information on traveling with your furry friend, check out our tips for flying with pets. Are you a frequent flier with pets? Share your flying tips in the comments.